U.S. Rep. Jared Polis of Boulder, who is seeking the Democratic nomination in Colorado's 2018 gubernatorial election, was the final speaker at the Pitkin County Democratic Party's Seventh Annual Dinner at T Lazy 7 Ranch on Wednesday. Other gubernatorial candidates to speak were Noel Ginsburg and Mike Johnston. 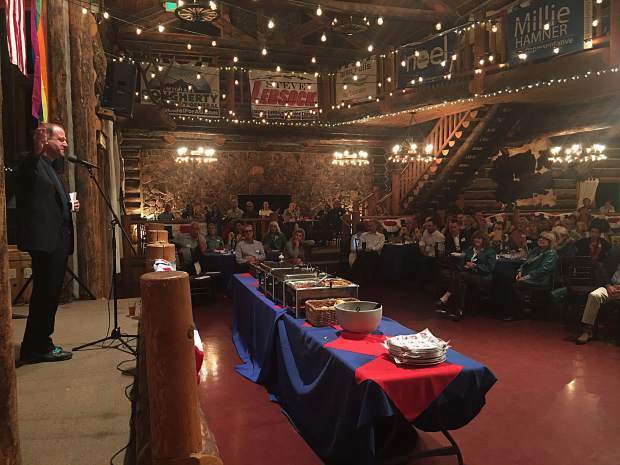 The Pitkin County Democrats went full-on fire and brimstone Wednesday at their Seventh Annual Dinner at T Lazy Ranch in an evening capped by three of the state’s gubernatorial candidates making their pitches to a sold-out gathering. T Lazy 7 is a large, rustic mountain cabin on the outskirts of Aspen, but on this night it oozed the feeling of a tent revival with Democratic politics, not old-time religion, taking center stage. Thirteen Democratic candidates jockeying for their party’s nomination for both state and federal offices schmoozed with potential donors and voters over cocktails and a barbecue buffet before they each capitalized on some time at the podium stating their cases. The evening’s main event came in the form of roughly 10-minute speeches from a trio of governor hopefuls — Denver businessman Noel Ginsburg, former state Sen. Mike Johnston, and U.S. Rep. Jared Polis. It was the first time that many Democratic candidates gunning for the gubernatorial nomination shared the same roof so far in the campaign’s early stages. Gov. John Hickenlooper can’t seek re-election because of term limits, which has created wide open fields in both major parties. Former state treasurer Cary Kennedy also has declared her candidacy for the Democratic nod in the governor’s race, but she could not attend because of a scheduling conflict, said Pitkin County Democratic Party Chairman Howard Wallach. Lt. Gov. Donna Lynn, who reportedly is considering a run but has not declared, also did not appear. She is in Aspen today to attend an Aspen Institute event with Hickenlooper. Ginsburg, the first of three speakers, touted his business experience as the owner and founder of Intertech Plastics as an asset he can bring to the political arena. He dropped out of college to start the business, he said. “I will probably be the first governor (of Colorado) who does not have a four-year degree,” he said. But he said his time in the manufacturing business — his trade is custom injection molding facilities, while he and his wife help inner-city children through the Colorado I Have a Dream Foundation — have armed him with the political chops to be Colorado’s next governor. “Simply having a business background does not qualify for running for office,” he said. “But it is the combination of leadership and things that people have done their entire life” that does. He also argued for equal rights for LGBTQ and took a shot at Trump for his transgender ban in the military. Johnston, a former state senator who hails from a family of educators, touted his time as a Colorado lawmaker helping pass the Dream Act, which enables undocumented state students to attend college. He also vowed to have the state run on 100 percent renewable energy, bridge the divide between Democrats and the GOP and create more jobs without compromising the state’s values. “If we are going to grow this state, we need to make sure it matches the values of the state,” he said. He decried the Trump administration for alienating much of America. “If this country is not going to build a harbor, then we need to make sure this state does,” he said. “How dare you?” he asked, saying Democrats are willing to improve the Affordable Care Act but not dismantle it. All three gubernatorial candidates also emphasized the importance of education and the economy. But given the short amount of time they spoke, they didn’t drill deep into the issues. That will certainly play out over the course of upcoming months. The candidates also struck a civil tone with each other, imploring those in attendance to engage in grassroots campaigning, talking to neighbors and researching the issues.